Valencia CF sporting director or technical director whatever you want to call his position Braulio Vazquez has confirmed that Valencia CF has several offers for Sofiane Feghouli. Report are that there are offers from PSG, AC Milan and few other teams for the services of Feghuoli. Valencia CF president Manuel Llorente has said that they are working hard to reach an agreement with Feghouli over the new deal which would have Feghuoli stay for the next 5 years at the club. Feghouli has also stated that he wants to stay, but both sides are having trouble reaching an agreement over the salary as some offers Feghouli has received have him earning over 3 million euros per year, while at Valencia CF he would earn a little less than 2 million euros. 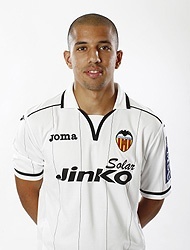 Now all this interest from other clubs shouldn't go to Sofiane Feghouli's head as he is still very young, he is still inconsistent and even though he is an integral part of Valencia CF right now, he doesn't have any competition for his position, so he is not as great or important as he no doubt would like to think of himself. So he can grow as a player, but also regress, we've seen those cases all too often where potential stars go fizzling out.